Welcome to another edition of “Life on Anime”… this time we’ll be taking a look at Hyouka – a 22 episode (23 if you count the OVA) mystery anime series produced by Kyoto Animation, best known for making the anime Free!. Sentai Filmworks licensed the 2012 animation and released it on blu-ray in February 2014. Houtarou Oreki lives by the motto “If I don’t have to do it, I won’t. If I do have to do it, make it quick.” He’s all about conserving his energy and putting forth minimal effort. His travelling sister convinces him to join the Classics Club in order to save it from shutting down. Given that the club has no members, to his knowledge, he decides to save it so that he has a private place to slack off. But his life is quickly turned upside down by Chitanda who joined the Classics Club before him. She’s easy-going and her curiosity is easily piqued. Chitanda doesn’t hesitate to pester the highly analytical Houtarou into satisfying her curiosity, no matter how trivial the problem. Houtarou’s long time friends Satoshi and Ibara join the Classics Club as well, helping him and Chitanda tackle locked room mysteries and delving into the shadowy history of their club, school, and festival. Hyouka is a beautiful series. It’s intelligent, witty, and intriguing. Each character has flaws and strenghts which play well off the rest of the cast. It’s a well balanced series with gorgeous animation, as expected from Kyo-Ani. The best part of Hyouka is solving the mysteries. Unlike other sleuth shows, Hyouka presents you with most of what you need to solve them on your own, or at least come up with logical conclusions. While it was very reminiscent of the story telling in Gosick, Hyouka’s mysteries were more grounded because they were set in our world, not a fantasy world where we don’t know all the rules. I liked this about Hyouka. The series pays homage to Sherlock Holmes and Agatha Cristie, truly fitting for the Classics Club. Fans of the classic mystery genre will eat this up. Houtarou’s mundane outlook on the world and constant criticism of students who aim to lead the “rose colored” school life is a bit overdone, but it fits his incredibly intelligent and analytical character. While he doesn’t think that everything is beneath him out of a superiority complex, he just doesn’t want to waste time on things that don’t matter to him. Friends matter, to a point. School matters, to a point. But sleeping is much more important. If the whole series were like that, it would be incredibly boring. But Chitanda manages to gradually break down the walls between Houtarou and the rest of the world. She’s a charming character with nil for character development. It’s fun to watch her eyes literally glow when she gets excited about a mystery and her imposing presence on Houtarou creates a fun dynamic between the duo. The supporting cast is small, but great. Satoshi and Ibara could have easily been the lead male and female of any RomCom anime. They’re both exceptionally smart, talented, and athletic. But, when you place them in the same room as Houtarou, they become insignificant and downplayed as each mystery’s plot thickens. While they’re able to keep pace with his intellect and wit, they’re no match for him because he has the gift and they don’t. No matter how hard they try, they’ll never be able to compete; they’ll always be in his shadow. This theme plays through the whole series, creating small nicks in Satoshi’s self-confidence. This takes the bro character to a completely different level, giving him more depth rather than having him always be a yes man to the lead. It’s in his struggle that the viewer can more easily relate to him and envy Houtarou. It’s easy to pity Satoshi, even though he has plenty going for him, more-so than the average high school kid. It’s easy to pity him until he acts like a jerk during a later episode. At that point, you want to punch him in the face. Again, this just adds more depth to his character and, considering how he is constantly struggling with himself, the jerk move he pulls somewhat suits him. Satoshi’s character is very reminiscent of Watson in Holmes. The setting for most of the mysteries revolve around the school’s upcoming culture festival. While the culture festival makes for a great quick backdrop for some drama in most anime, with Hyouka, it has a lot more depth. The characters solve mysteries about the origins of the festival and later take on a mystery about “lost” objects at the festival, the mystery of how a movie was supposed to end that will be aired at the festival, their own problems about selling the stock they ordered too much of, and smaller mysteries that are sewn into these bigger plot points. With each of these puzzles co-existing and intertwining while the subplots of romance, self-acceptance, and character development play underneath, the series moves at a great pace, even with the loads of dialogue. 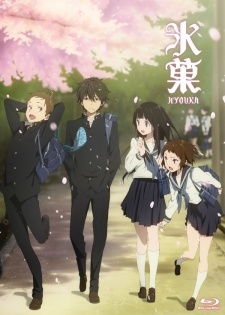 To make Hyouka more unique, one of the mysteries is set during the Doll Festival, something that’s popular in Japan that usually isn’t represented in anime. Hyouka does a lot of things right and, for a mystery series, it’s pretty darn good. I was slightly disappointed in the ending. While it brought Houtarou’s character really close to closure, there were many plot points that were left unresolved. Had these plot points been minor story elements, it could be overlooked to chalked up to a push for a second season. But these were main themes that Kyo-Ani introduced in episode one and made a point to continuously develop throughout the series. In that regard, I was disappointed. In the last four minutes of the series, Kyo-Ani teases the viewer with gorgeous animation and a glimpse into what many would consider to be a great ending that provides closure. But it was just a glimpse, that’s it: just something that Houtarou thought about saying. Instead, we get the ambiguous ending that we get with every other generic anime. In that regard, it was disappointing. I felt like they pulled a bait and switch over on me. Hyouka is worth watching if for nothing more than the mysteries and stellar animation. For a 2012 anime, the production quality is still better than most of the fodder you see in the 2015 market. Kyoto Animation is definitely a cut above the rest in that department. The lack luster ending leaves me, personally, wanting more. However, I could see most anime fans being satisfied with it. I’m just picky about my endings. When you watch it, make sure you watch the OVA after episode eleven. It fits nicely in the series at that point. If you enjoyed this series or if you’re interested in great mysteries, check out Gosick too. You won’t be disappointed.